The National Park Service and its contractors serve more than 23.5 million customers each year at more than 250 food and beverage operations operated by concessionaires in 75 parks. The entire park system hosts about 274 million visitors a year. They get hungry and want to eat. At left, some of the selections of food available at Yellowstone National Park (Photo by Qianli Ma). Below, the beautiful scenery of Yellowstone and Grand Canyon national parks (Staff photos). The Healthy and Sustainable Food Program (HSFP) provides standards and resources for parks to ensure visitors and tourists have healthy food available. The National Park Service sets policies for healthy sustainable food sales. These standards are required to be part of any contracts the federal government issues to concession operators, such as companies that operate restaurants, cafeterias, snack bars, stores, lodges, inns, and other locations that serve or sell food. “There is no reason that you should have to take a vacation from eating well when you visit a national park,” Jonathan Jarvis, National Park Service director, said in an NPS press release. Among national parks, one of the best food service operations is found at Yellowstone National Park. 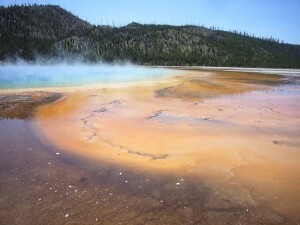 Visitors are able to find various foods in all six parts in the Yellowstone –– Grant Village, Canyon Village, Yellowstone Lake, Mammoth Hot Springs, Old Faithful and Roosevelt Lodge. 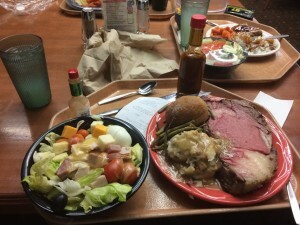 Food is found in restaurants at lodges, cafeterias, and shops or groceries throughout the park. One reason for the diverse food service in Yellowstone is because several lodges are located within the vast Yellowstone park space. Thus, it is convenience for tourists to find food. If visitors’ plans call for a day of fishing, hiking or just being outdoors, they can order a box lunch from any dining facility or cafeteria. Tracey Sutton, an assistant reservations manager for Yellowstone National Park concessionaire Xanterra Parks and Resorts, explained how her park facilities at the lodges work. 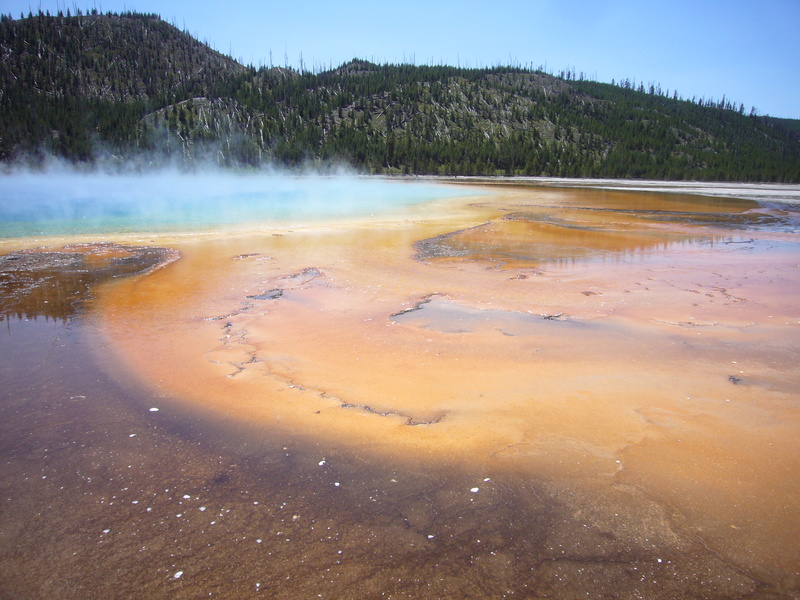 Click on the video at left to view an audio slideshow about foods in national parks, such as Grand Canyon and Yellowstone, prepared by writer Xuanchen Fan. What is more, she added, the full-service dining rooms also serve a broad selection of delicious appetizers, entrees and desserts. 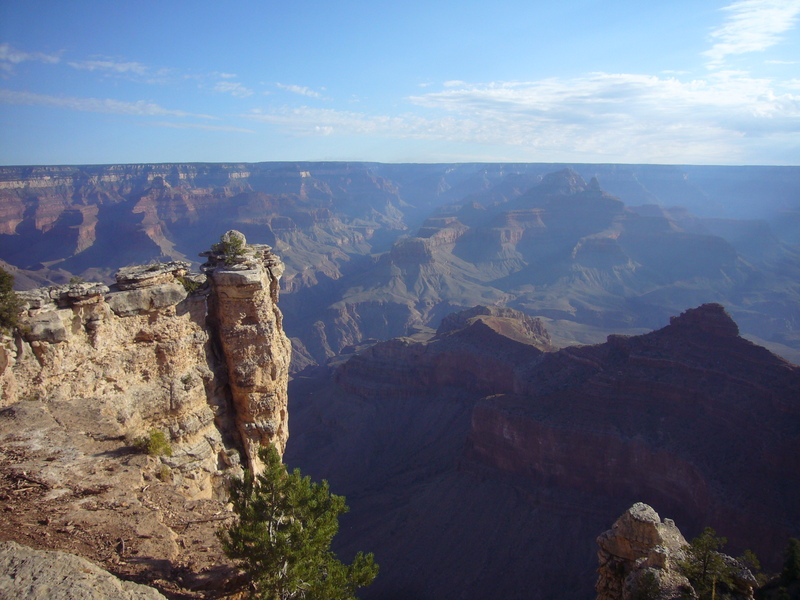 In contrast to Yellowstone, Grand Canyon National Park offers fewer food service options within the park. While many South Rim area food facilities are in Tusayan, a gateway community just south of the park entrance, there are a few restaurants, a cafeteria, general store and grocery, and other shops that offer food within the South Rim area of the park. One of the most popular places to order food is Yavapai Cafeteria, which is near the Market Plaza. It offers “grab and go” food and beverage service targeted towards hikers, bikers and pedestrians. The lodges on the South Rim also have two restaurants and several shops or stores offering food or snacks. Some restaurants are open seasonally. The historic El Tovar Lodge’s dining room and lounge, which is located on the South Rim, just open in April through October. And the Arizona Room is closed in November and December. The food served in these two restaurants are much more expensive than other facilities. Grace Zhao, a senior in the University of Miami, said she was not happy with the costs. He Gong, a sophomore in the University of Miami, said he felt the choices were quite limited. “I will never go to the Grand Canyon again, due to the absence of restaurants,” he said. Some restaurants are available in Tusayan, which is seven miles south of Grand Canyon Village and requires leaving the park. And many of these restaurants provide fast food, such as, McDonald’s, Pizza Hut and Wendy’s. There are a limited number of full-service restaurants for visitors in Tusayan. Grand Canyon National Park is far from developed areas and this limits food availability in some ways. It is hard to bring food and resources to this remote area and, when it is done, the expense must be added to the preparation and service costs. Recently, people have started to pay more attention to the Grand Canyon region’s support services such as food and lodging. The proposed $1 billion Grand Canyon Escalade development, a complex of restaurants and stores just outside the Grand Canyon park boundaries, is one example. It has drawn both support and opposition from different groups in the area.